Wow yourself with this neat idea. • Use a pipe cleaner and make a shape like a heart, snowflake, star, flower, or whatever. • If you are too young to boil water, ask mom to boil enough water and put it in a container so that it will completely cover the shape you made. • Stir in one cup of 20 Mule Team Borax Laundry Booster. • Tie a thread on your shape, suspend it from a pencil, and center the pencil on the top of the container so that the shape is not touching the sides or bottom of the container. In a couple of hours, crystals will begin to form on the shape. The longer you leave it in the solution, the thicker the crystals will be. They will be beautiful. Try it and see. • Using a ball of yarn, tie the yarn at the beginning of your ball around your index finger. • Face your palm up and let the tail fall into your palm. • Wrap the yarn coming from the ball in a circle so that you have a strand of yarn wrapped above the tied yarn on your index finger. • With the fingers of your other hand, lift the bottom loop over the top loop and drop it off the back of your finger. • Repeat these steps and soon a chain will begin to form. Continue until the chain is as long as you want it to be. • Finish by pushing the end of the yarn through the last loop and pull tightly. Use the chain to make bracelets, necklaces, rugs, frames, or even as hair on pictures of people that you draw. • BEFORE you do, make a top and bottom fin and a heart-shaped mouth and tail. Glue these pieces on the label side of the CD. • Also glue in fishing line, nylon thread or thin string to hang your fish. • Now, glue the two CD’s together. 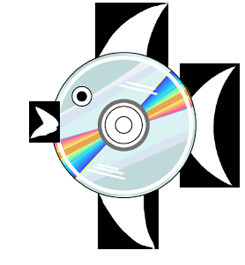 • Fan fold a piece of colorful paper and insert through the hole in the middle of the CD. • Use a marker, plastic eye, or paper for eyes. Make one and hang it, or make several and make a mobile. Put them in a window and watch the sun catch the iridescent silver on the CD’s. Got a puzzle with pieces missing? • Take several pieces and glue them together to make a colorful pin. Pieces can also be painted before gluing together. Buy a package of pin backs and white glue or hot glue them to the back of the puzzle pin. • Ask mom to help if you plan to use hot glue. 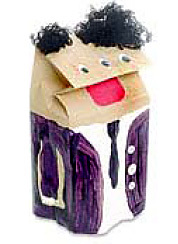 Each member of the family can make a puppet that represents him or her out of a paper lunch bag. nose. The mouth will be in the fold of the bag. puppet look as if it is speaking. Be creative with your puppets. Tell a story, put on a play, or just have a conversation using your puppet to do the talking! Have someone show you how to knit, sew, weave, cross-stitch, or make jewelry. Use an empty plastic 2-liter bottle and transform it into a terrarium. • First remove label and cap from the 2-liter bottle (Goo Gone, nail polish remover, or mineral spirits will help). • Have an adult cut off the bottom of the 2-liter bottle (about 2”) and place about 1 1/2 “ of potting soil in the bottom base. Press your seedling into the soil until it is no longer visible. Add a little water. • Have an adult cut three or four 1” slashes in the bottle to let the heat out of your terrarium or your plant will “cook” in the bottle. • Place the bottle right side up over the baseand press firmly until the base and bottle are rejoined. Now your terrarium is complete! Don’t forget to keep the soil moist by watering it occasionally. • Once your plants have grown tall enough to touch the top of the inside of the bottle, remove the top of the bottle and transplant them into a garden. Be sure not to let your plant grow through the top because you won’t be able to remove it and your plant will not thrive.